As this is my first visit to India, I have to say honestly that I didn’t expect to see how important Art and aesthetic, more generally, are to the people of the region of Tamil Nadu (it would not be a mistake to extrapolate to the whole India I suppose…). Beauty seems to be everywhere starting with the water flower display (cf. image) that we could gladly admire when passing by at the lobby of the hostel. It was renewed with a lot of care every 10 days or so, in order for the flowers being displayed to always be fresh and therefore keep refreshing our mind every time we would be passing by… I also noticed how much attention is brought to the design of the water flower display so that the shape of the flowers is always harmonious. Usha, the manager of the hostel, once asked for the shape to be modified so that the colors of the outer circle would be more consistent with the color of the following circle. Art is everywhere in Auroville and in the surrounding villages. Colors are extremely present and important starting with the ones that we see on the saris worn by women. They also are so generously present on the -often very impressive- Kolams created on the ground -by Usha and her team at the hostel- and in front of shops in Kullapayam village. 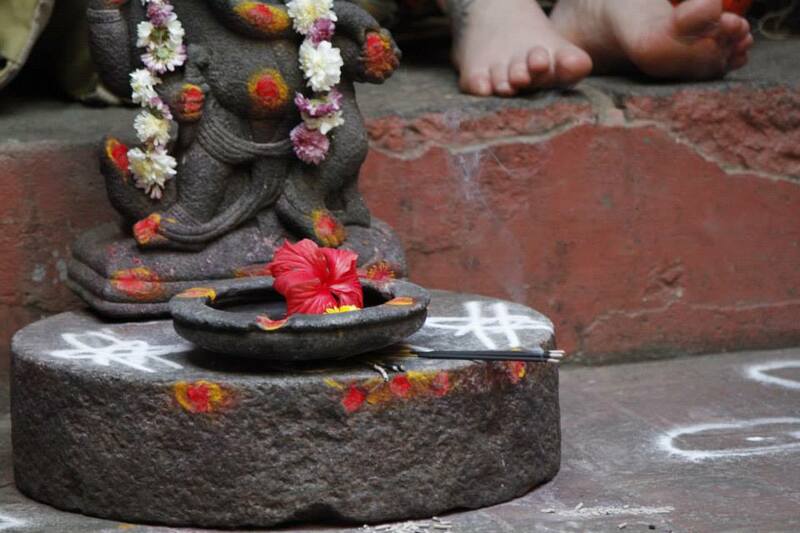 “Kolams are thought to bring prosperity to homes” according to Wikipedia. Take a look a the Wikipedia article ! Music too is omnipresent. Very often, there is a very loud music coming out of the temples and it is that same music that would wake us up in the early hours of the day at the hostel. Aesthetic is present in the smell also with delicious incense smells found all around the place in shops and open spaces. Art and aesthetic are everywhere. This is for me a clear sign that we are inside a very sophisticated civilization. Head bobble … Oh my head bobble ! One of the most notable means of communication that we have been exposed to is the head bobble©™, a sign of successful integration to the Indian culture according to me. This is a very interesting gesture to be analyzed for the field of communication. It is very interesting at the many levels, including the anthropological level. The head bobble is an unavoidable “tool” of nonverbal communication to consider for achieving a successful communication in the Indian environment, in particular in the South regions. By successful communication, I mean delivering your verbal message successfully but most importantly a successful communication should make your interlocutor feel that you are a part of his/her group, which will increase the legitimacy and the weight of your discourse. A correct verbal communication that includes the head bobble is the upmost form of communication in Southern India, in my opinion. Now, let take a closer look at the signification of the head bobble©™. The latter has a connotation of positivity, agreement, approval, conciliation, support and encouragement. An ethnocentric interpretation can be misleading, if taken from a western standpoint; the head bobble is far from expressing the hesitation or the polite “no” that we find in the Western world. Instead; the head bobble©™ carries a different meaning that regroups words and significations such as “I understand”, “ok”, “good”, “nice”, “beautiful”. A lot of people would be head bobbling when talking to us, in particular when they wanted to express hospitality, acknowledgement for our action during the visits at the units. After several days of immersion, it was surprising to notice how some people had unconsciously -I believe- integrated the head bobble in their body language when talking to our fellow Indians friends in Auroville and its surroundings. Time is running out. It is only a day left before the presentations and the day after I´m leaving for the airport. The time has gone by so fast even though it feels like we have been here for months. We have done and seen so much, it has definitely been a different and wonderful experience coming here. Meeting all of the passionate and inspiring people, seeing amazing places and just experiencing the Indian culture has been more than I could have expected. Looking back now on the journey I realize that I have not been able to make up my mind about Auroville, I have fallen in love with the idea of what it is supposed to be and many of the people are wonderful but there are some contradictions in the society I feel. It is supposed to be welcoming to all, but it takes time to become an Aurovilian and if you’re not then you are categorized as a guest, visitor or newcomer. I do understand that they are careful with whom they let in as a true Aurovilian but I am having a hard time looking past the categorizing of people and see that as a bit discriminating. With that said I do like it here, it is very beautiful and peaceful. The people we have met during our visits to the different NGO´s have all been great. One thing that I have noticed is that they are very humble and do not like to get too much attention. When we applauded in the end of their presentations most of them became slightly uncomfortable and seemed like they just wanted to give back all of the applause to us again. Even though they deserve all of the positive respond I actually appreciated this quality in them. It felt genuine and real. I have become more confident in my role as a communicator and have realized that the knowledge I need I already have. This is probably the most important lesson I have learned and will bring with me in the future. To learn that about myself is unexpected but I could have not wished for more. 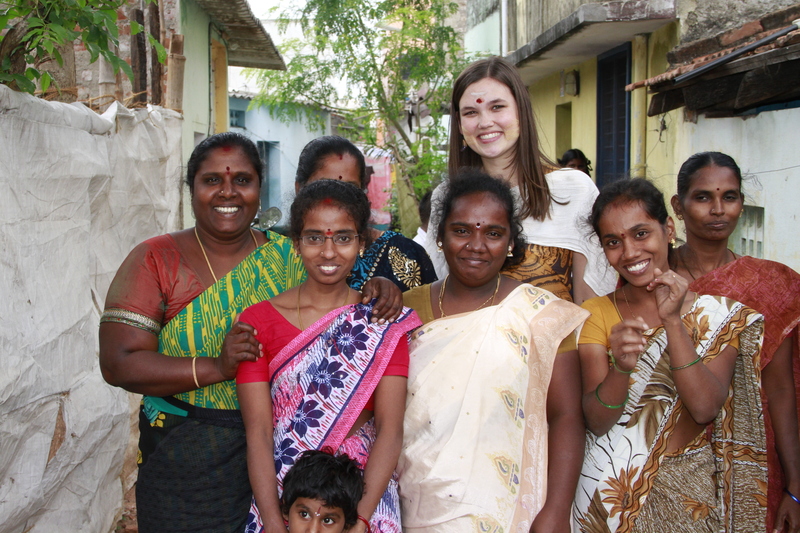 This practicum here in Auroville, India has given me so much. I have developed new relationships, grown as a communicator, learned and seen a lot and just had an incredible time. I am lucky to have had the opportunity to come here and partake in this practicum, so for that I would like to thank everybody who has been involved and made this trip one to remember. I’m one semester from my bachelor degree in Development Communication, and today I can for the first time say that I have gained experience in the field. For the last couple of weeks I have been working together with the Auroville Bamboo Centre, designing information panels for them to bring to a national Bamboo exhibition. Working practically has been a great experience. For the first time I have been forced to put some of my skills to practice. Three weeks ago I had almost zero InDesign knowledge but today I sit here with three complete panels that actually look good. There have been obstacles on the way here, but I guess that’s just how it is when working with other human beings who are not a 100% sure of what they need or want. I have been forced to adjust the content a couple of times because of misunderstandings or misinformation. It is not easy joining an organization as a complete outsider, having no knowledge at all about bamboo or the goals and missions of the organization. You really have to start from scratch and collect all the little details. I had several problems in the beginning and often felt that I did not have the necessary skills. However, there is nothing that a couple of extra meetings won’t solve, and after the last meeting I really felt that I understood what the final product was supposed to look like. It also helped that I conducted a more detailed target group analysis. When I left Sweden for Auroville I had one goal, I wanted to work on a project that could bring me personal growth, and today I feel that that goal is accomplished. I definitely feel that my communication skills have been given a real boost, and just the mere knowledge of that I am able to produce products on a tight schedule in real organization feels good. This is far from writing papers or handing in group assignments, the Auroville Bamboo Centre is a real functioning organization and hopefully they will profit from my work. Travelling with a clean conscious. What’s okay and what’s not? Every day all year around you face this dilemma in your daily life. It does not matter if you are in India or Sweden, although spending a couple of weeks in a place like Auroville might get your mind spinning and your thought wrapped around these everyday dilemmas. The questions you have to decide upon vary depending on many different variables: cheap or expensive, quality or quantity etc. These are of course all complex questions but for me, but they have one common denominator, and that is to always reflect upon your choices. For me it is important to have this mindset because without it you are already making the decision not to take action. You might end up with a perfectly fine lifestyle but not in all cases. I must admit that I often “don’t practice what I preach” and honesty I don’t know why. There are most probably a lot of reasons. The point I am trying to make is that in a place like Auroville one begins to considering how one actually choose to structure everyday life, a bit more than in other places. And if you are not aware, you cannot act. Creche Visits and Microfinance Insights – Welcome to My Days at PSDF! I am nearing the end of my internship with The People’s Social Development Foundation (PSDF) and have had an incredible experience. PSDF works to improve the socio-economic welfare of the Dalit community and women in the rural and slum villages surrounding the city of Pondicherry through awareness programs, childcare support services, disaster relief, family counseling, micro-credit entrepreneurship programs, and vocational training. 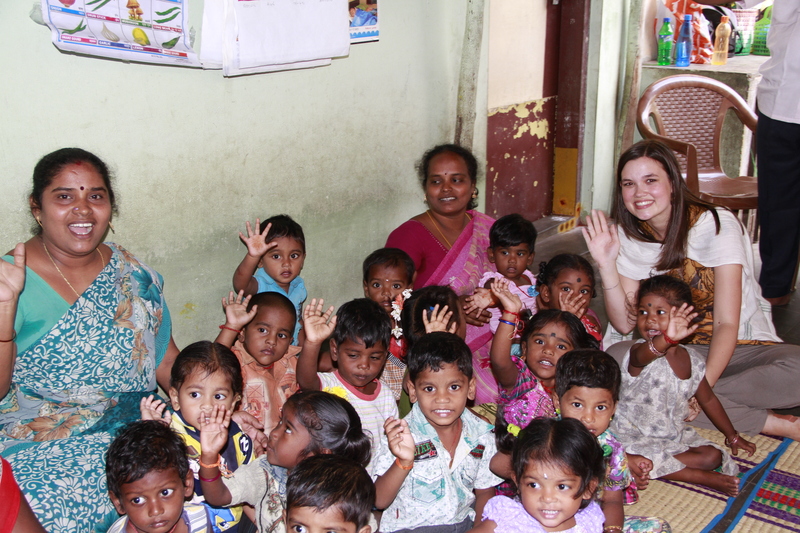 My favorite day of my internship thus far included site visits to 3 of the crèches (daycare/ pre-primary education centers) that PSDF runs in coordination with the Government of India’s Rajiv Gandhi National Crèche Scheme. 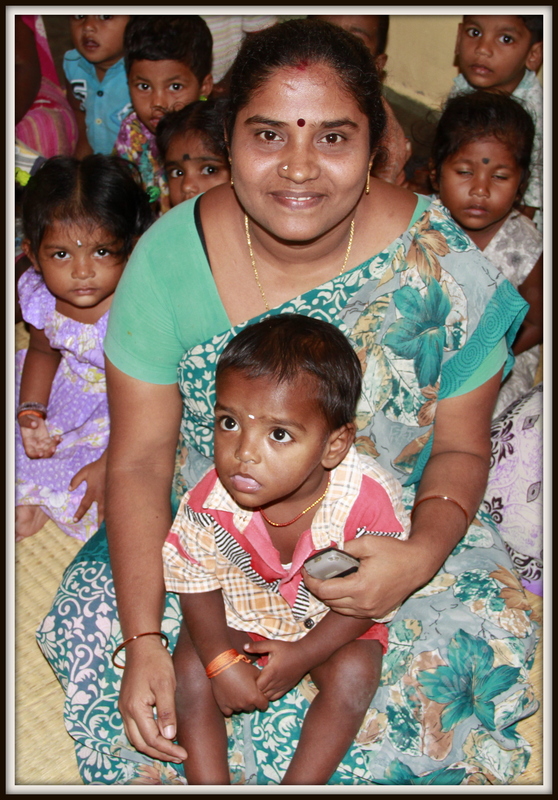 The Rajiv Ghandi National Crèche Scheme For the Children of Working Mothers was started by the Government of India (GOI) in recognition of the “failure to meet the needs of working mothers” in need of “quality substitute care for their young children while they are at work.” As free, public education is not provided for Indian children until they reach 4 years of age, families unable to afford private daycare fees must care for their young children on their own until they can begin school. Most of the children’s parents work as day laborers in factories, and while this provides generally consistent work, wages are very low, between 80-100 rupees day (approx. $1.30-1.62), and no benefits are provided. If both parents are able to bring in these wages consistently, the family can cover its basic shelter, food and clothing costs, but face difficulty any time a large or unexpected expense comes up, such as school tuition or sickness. Mothers who have to take care of children are unable to work at the factories as they provide no childcare services, thus imposing a great amount of financial stress on these families. Even if the child remains at home with their mother or another relative, it is rare for them to receive the kind of educational attention provided at the crèches, as many families are illiterate and/or do not speak English. Children thus enter school with little prior experience in reading or educational activity, making it easy for them to fall behind quickly. I headed out to the crèches in the hopes of gathering lots of information and individual stories about the children in the crèches in order to assist my grant-writing and fundraising for PSDF and was able to gather quite a bit of good material even if it wasn’t what I was expecting! I did not anticipate that so many of the crèche teachers would be involved in or lead PSDF Micro-Credit Self Help Groups (SHGs) as well as teach in the crèches. I was struck by how both of the women that I interviewed more intensively really focused in on the social/non-economic impact of the SHGs and microfinance plans. I kept pushing questions about how/if microfinance had raised their living standards and what kind of income micro businesses generated in relation to other jobs – but after awhile my translator Segar laughingly told me that this topic didn’t seem to be what they were most interested in. Instead, the women kept telling him about the support system that the SHG had created for them. Instead of simply grouping together in order to be able to have access to loans, PSDF requires its SHGs to save on their own through monthly contributions (usually 50-100 rupees) by each member. The women talked about how having this pool of savings took away their fear that even a small misfortune, such as a family member falling ill, could wreak havoc on their family financially. All of the women understand that misfortune could hit anyone of them, and thus know that even if their savings are going to help someone else in the immediate term, in the long term it is also providing security for them. Furthermore, the women told me about the strong bond that the SHG creates. For example, one told how in her group they are “each other’s biggest cheerleaders” and that if one woman opens a microbusiness, the group all comes on the first day to be her first customers. They then make sure to wear/show the products they bought around the village and surrounding villages, as a form of free advertising by word of mouth. The sari she was wearing that day was made by a member of her SHG, and she said that she drops that fact into conversation as much as possible to get the word out. Furthermore, through the education and awareness programs that PSDF conducts each month with the SHGs, the women bond even more by talking about issues that are often taboo, such as menstruation, domestic violence, dowry issues, and child abuse. The women see that they are not alone in their problems and can brainstorm ways to help each other or encourage each other to bring large issues to the Family Counseling Center at PSDF. Listening to the children sing and recite in English – very impressive for only 1-3 years old! If you are interested in learning more about PSDF’s Crèche Program and how you can help them, please click here to be taken to their website. PSDF is currently conducting a 1 month “Crèche for Success” fundraiser to raise money to reopen 5 crèches that have been closed in the past 2 years due to lack of funds, leaving 125 children without free care and education during the day. $14 and 5 minutes of your time is all it takes to cover 2 children’s basic educational costs for an entire year! Thanks in advance for your interest and generosity!! Words have the ability to Empower or Disempower. From our visit at PSDF I learned the complexity of communication in practice, and particularly when the language is not shared. The true lesson was however how easy it is to overlook to live how you teach. We have learned the value of participation and the power of listening as a golden rule of gaining trust and building relationships built on empathy. Nonetheless, that awareness was not to be seen at our visit at PSDF. The “champions” of the organization prepared a presentation which they were never given the chance to fully present to us. We silenced them, due to factors of us having the right skills (English) and to lack of time. I hope they were not left with the same feelings as I was.